October 17 2015. The 2015 USATF 5 Kilometer Masters Cross Country Championships will be held tomorrow at the Saratoga Spa State Park in Saratoga Springs NY as part of the Saratoga Cross Country Classic. Race Director, Pat Glover has done a terrific job of bringing together a field of top individual runners and teams. Nearly 300 Masters runners are registered including some of the top Masters runners in the country. Between the women and the men there will be 40 teams competing for team honors in the various age categories from 40+ to 70+. While most teams are from the northeast, the Impala Racing team competing for the 60+ crown comes all the way from San Francisco. On the men's side it is much the same except that the Atlanta Track Club is sending both a 40+ and a 70+ team up from the South. Brief Preview. With apologies, I admit that I will only have time to do a brief and incomplete preview of the races. There are too many events and too many other things going on with various running and teaching enterprises. Previews and picks will, by necessity, be based on my existing knowledge of top Masters runners. And, because the road 5K championships were only 2 weeks ago at a relatively nearby location, many of the same runners are entered; I will rely heavily on those results. If there are others with whom I am not familiar or who did not compete at Syracuse, they will be undervalued in this preview but will shine in the recap! Overall. This looks like a repeat of the recent USATF Masters 5k road championships in Syracuse. The three main contenders from that race are all registered. Marisa Sutera Strange (Athena Track Club) will enter as the favorite based on her strong win in Syracuse. Karen Simmonds-Brady, who finished 2nd at Syracuse is not entered but Renee Tolan (Kinetic Running Club) and Jennifer St. Jean (Westchester Track Club) are. Tolan finished third at Syracuse but St. Jean, who ws expected to compete for a top spot, was kept away by family responsibilities related to the threat of Hurricane Joaquin. There are many imponderables but thinking of St. Jean as more of a track runner, I'll pick: Strange, Tolan and St. Jean. Overall. Using the same logic, Chad Newton (Atlanta Track Club) is the favorite after his 2nd place finish to Greg Mitchell who is not entered here. His two teammates who finished 2nd and 4th at Syracuse, Alan Black and Kristian Blaich, are elsewhere this weekend. So I will go with the 3rd and 5th place finishers from Syracuse, Philippe Rolly (Baltimore Washington Track Club) and Nat Larson (unaffiliated). Newton, Rolly, Larson. 40-44. Of those who ran Syracuse and are entered here it would look like Tolan for 1st, and Genesee Valley Harrier teammates, Heather Webster for 2nd and Melissa Senall for 3rd. But, as noted above, St. Jean is a wild card here. To be consistent,, I should pick her for the 2nd place finish: Tolan. St. Jean, Webster. 45-49. The 2nd and 3rd place finishers from Syracuse, Emily Bryans (Willow Street AC) and Audra Naujokas-Knapp (Genesee Valley Harriers) are the favorites to go 1-2 here. But none of the other top finishers from Syracuse are entered. In the absence of other information, I will go with Cecilia Regan (Greater Philadelpia TC) on the grounds that she had farther to travel so must have felt she had a shot at a good race finish. Bryans, Naujokas-Knapp, Regan. 50-54. The top finishers from Syracuse are back at it again. I will let their finishes there be my guide with one exception: Strange for a big win. Karyl Sargent (Syracuse Track Club) enjoyed a one second victory over Lorraine Jasper (Athena Track Club). That sounds like it was, perhaps, a good kick from Sargent that got the win. Just for fun let us see if Jasper has learned how to beat Sargent on a cross country course. If so these two rivals from the Northeast will have split top honors at these two national championships. Strange, Jasper, Sargent. 55-59. The 2nd, 3rd, and 5th place finishers from Syracuse are back to compete on the Saratoga paths. Collen Magnussen (GVH) should take the crown by a wide margin over her teammate,. Marie White (GVH). White was 5th at Syracuse but finished over 2 minutes back. This looks like a division begging for more analysis. Perhaps there is another contender who can upset the apple-cart and take the 2nd away from White. I will guess that Nancy Simmons (Tamalpa Runners) will not have made a coast-to-coast trip without at least some thought of a medal. Magnussen, Simmons, White. 60-64. As in Syracuse this division should go to Kathy Martin (Northport Running Club) by a very wide margin. Athena and GVH rivals, Coreen Steinbach and Sharon Moore respectively, should duke it out for 2nd. Just for fun let's say the Moore will out-duel Steinbach this time and reverse the 3 second victory Steinbach enjoyed at Syracuse. Martin. Moore, Steinbach. 65-69. This is a tough one to handicap without a bit of research. None of the leaders from Syracuse is entered. I will make the west coast import, JoAnne Rowlands (Impala rcing Team) the favorite based on her win at Brea CA in the 8K championship in February. I will make a guess that Carolyn Smith-Hanna (GVH) can take 2nd. But who will be the other contender? In this case I go with the unaffiliated runner, Terry Foody, since none of the entrants are making a long trip and there is no other basis for picking. An unaffiliated runner is deciding to make the race on her own so may have a good chance. Rowlands, Smith-Hanna,Foody. 70-74. This is, surprisingly, an empty category so easy to handicap. 75-79. Madeline Bost (Morristown County Striders) should make it two in a row with a win at Saratoga Springs today. For now I will go with Sandra Folzer (Greater Phildelphi Track Club) on the grounds that she had farther to travel. Bost, Folzer, and that leaves Marge Raczjewski (Saratoga Striders) in 3rd. Bost, Folzer, Racjzewski. 80-84. Mary Harada (Liberty Athletic Club) is the only entrant and so a very safe pick for the win., a gold medal trip from the Greater Boston area. Harada. 40-44. Rolly is the only predicted top overall finisher from the 40-44 group. So who will be fighting him for 40-44 supremacy? Mark Williams and Volker Burkowski finished 7th and 9th st Syracuse, 19 and 39 seconds respectively behind Rolly. Rolly, Williams, Burkowski. 45-49. Newton should take the gold by a strong margin. Tim van Orden (Central Mass Striders) and Jeff Conston (Westchester TC) finished 3rd and 6th at Syracuse so I make them my 2nd and 3rd picks. 50-54. Here I will pick Mike Nier (GVH) and Alan Evans (GVH) to be again attempting to chase down the unaffiliated Nat Larson. They could not get it done at Dedham in the 10K in April, nor 2 weeks ago in Syracuse. But perhaps the cross country paths are more to their liking. GVH has had great success at cross country over the years. And Francis Burdett, if at full fitness as earlier this year when he won gold in this group in the mountains and on the west coast, will try to break things up. We shall see; this should be a race to watch! Larson, Niers, Evans. 55-59. None of the top 12 from Syracuse are entered here so there is no hope there. Turning back to the 10K at Dedham earlier in the year do I get any help? John Griego (Central Mass Striders) took 7th in that race. except for that, I am picking blind. I will pick one from the unaffiliated group, Gary Burak and one of the two who traveled the farthest, either Charles Shields or Carl Stocking. Griego, Burak, Shields. 60-64. From hardly any information to lots. This race is comparatively easy to handicap as it looks like a classic 'nor'easter'--a battle between Jersey and New York. The interlopers from west and south are not here today. Reno Stirrat (Shore AC) who took 3rd at Syracuse is the favorite today, followed by those who finished 4th and 8th, Mark Rybinski (GVH) and Stirrat's teammate, Patrick Gaughan (Shore AC). Stirrat only beat Rybinski by a second at Syracuse and Rybinski will have great incentive to turn the tables but for now I will stick with Stirrat for the win. Stirrat, Rybinski, Gaughan. 65-69. 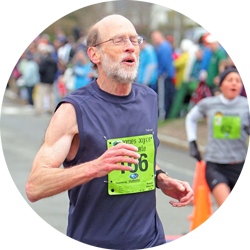 Bill Dixon (Greater Lowell Road Runners), the victor and one of the top age-graders at Syracuse, is entered so is the strong favorite. Doc Rappole (GVH) finished 3rd at Syracuse but is on the comeback trail from an injury so I guess he is still improving. So he is a strong 2nd place prediction. Bob Giambolvo (unaffiliated) was one of my predictions for being a medal contender at Syracuse but he did not run. So I will add him to the list. He could take 2nd from Rappole.Dixon, Rappole, Giambalvo. 70-74. In the absence of Doug Goodhue, Przemyslaw Nowicki (Shore AC) becomes the favorite after his strong silver medal run at Syracuse. His teammate, J.L. Seymore, should have a good shot at 2nd. After that it is hard to tell. Using my earlier logic I will go with the only unaffiliated runner in the group, Thomas Murtaugh, Sr.. Nowicki, Seymore, Murtaugh. 75-79. John Elliott (Potomac Valley Track Club) was the favorite to take this age group at Syracuse before the threat of Hurricane Joaquin kept him home. He will be the favorite at Saratoga Springs. Ron Mastin (Atlanta Track Club) and Roland Cormier (Shore AC) who finished 1st and 2nd at Syracuse, will be chasing him down. Elliott, Mastin, Cormier. 80-84. There is no help here as neither of the entrants competed at Syracuse. I will go witht he runn er making the longer trip and make Joe Desenberg (Anna Arbor TC) the favorite, with local runner, Walter McConnell (Adirondack TC) in 2nd. Desenberg, McConnell.